Supplier & Manufacturer of Brinell Microscope. 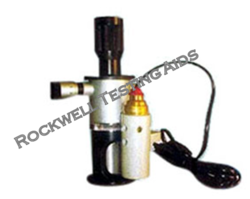 Our product range also comprises of Accessories of Hardness Tester, Rockwell Hardness Testers and Portable Dynamic Hardness Tester. We offer a compact and versatile instrument for linear measurement which hasa pre- focused objective and is therefore, suitable only for flat objects. The measurementsare directly read on glass scale incorporated in the eye piece. The reticleis calibrated in 0.1 mm units over a range of 7 mm and the diameter of microscopefield is ammo This microscope has a magnification of 25x which allowsthe user to measure the diameters of indentations made by the ball indenters ofall brinell type hardness testing machines. This microscope is also easily usedas a calibrated portable microscope and is supplied with 7w- 220v lighting attachment. Precise measurement for the diameter of indentation in Brinell hardness testing. Detemining the width and length of scale mark, Slit, key slot and dent, etc. Checking the metal surface quality, density of fibre and field specimens, etc. 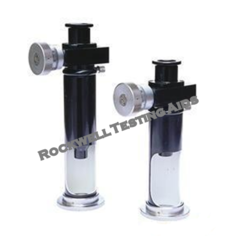 We are supplier of all type of ball indentor and ball holder for Hardness Testing machines. 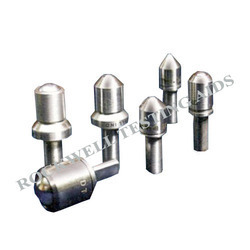 We have a wide range of ball indentor and ball holder in stock such as 1/16", 1/8", 1/4", 1/2", 10mm, 5mm, 2.5mm.